Welcome to the first blog of the Cricket Without Boundaries (CWB) Autumn trips! My name is Dave Terrace, a long time CWB volunteer, and I have been enviously watching all the new and returning volunteers experience the training weekend in anticipation of their autumn trip (unfortunately I’m not going this time). This blog is a reflection of day one of the CWB training weekend. 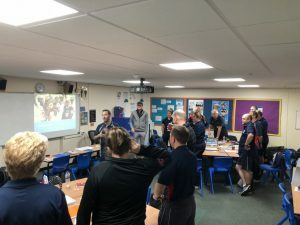 As people filtered into a small teaching room in a suburban school in Coventry, it became clear that there was a healthy mix of experienced heads and enthusiastic new volunteers. The new volunteers nervously scanned the room, somewhat unsure of what laid ahead. However, as usual the ice breaker did its job and the new volunteers were soon chucking a tennis ball round a hall. It struck me immediately how confident people were, going all out in the warm up. Equally, there was instant engagement in the social messages, with intelligent questions and inclusive conversations about sensitive topics. The flow of the weekend is designed so more of the core CWB team’s voices are heard at the start, then gradually the project volunteers take over the weekend and start delivering. One key core voice was founding trustee Chris Kangis, whose emotional reflection on the journey of CWB served to remind all the volunteers why they give up their precious time. CWB is about providing those without opportunity a chance to play and to re-enforce positive social messages and behaviours. This set the context perfectly for the practical drills. Now, it is somewhat of a leap to imagine how drills in a sports hall in drizzly Coventry is useful training for coaching 1,000 enthusiastic Kenyan children, yet somehow our CWB coaches made it happen. Buzzing around the hall with endless energy and booming voices, Lee, Sara and Pete created a fun atmosphere focusing on teamwork. 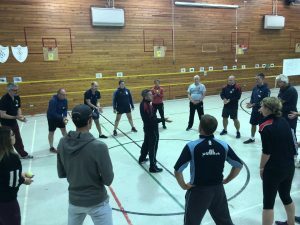 The new coaches quickly soaked up the coaching points and more importantly the integrated coaching style, as they started to deliver their sessions. Calls of ‘AWOOGA’ and ‘CONDOM’ echoed through the hall as the new volunteers grew in confidence and lost their inhibitions. The two groups of volunteers, heading to Rwanda and Kenya, have a range of cricketing ability but clearly share a willingness to help out and a passion for the game or else they wouldn’t be there. The weekend is the culmination of a long journey, from application through fundraising and is the ‘real’ start of their CWB experience. The two groups are some of the best I’ve seen as they quickly embrace the notion that their goal isn’t to deliver the perfect forward defensive, it’s to be positive role models. To a person they leap into delivering sessions, asking questions and providing feedback. As I scan the hall I can see bats being written on, busting myths with every hit. The volunteers are getting the raison d’etre of CWB – positive social messages through cricket.